The Old Comprehensive Immigration Reform Model Is Dead. And, That’s a Good Thing. Last week, Julián Castro became the first Democratic presidential hopeful to lay out a concrete immigration proposal, which he called “compassionate immigration reform.” Our headlines are dominated by immigration-related news — in no small part because it’s been the issue Trump has used to rile up his base and divide our country since his very first speech launching his presidential run in 2015. In light of this basic political reality, Castro’s proposal is a welcome change of pace and tone. While we’ve seen bold Democratic proposals on housing, teacher pay, health care, climate change, and economic justice, the Democratic field has until now been nearly silent on Trump’s signature issue. If Democrats want to take back the White House in 2020, they’ll need to redefine the debate around how a progressive immigration reform agenda can benefit the country as a whole, and offer a real alternative to Trump’s anti-immigrant agenda. Simply defaulting to the standard position of support for “CIR” would be a mistake, especially since the traditional “comprehensive” model is itself outdated and flawed. Previous federal legislative immigration reform frameworks, which we have come to know as CIR, have suffered from three fatal flaws: First, they have been premised on the idea that lawful status for undocumented immigrants can only be provided in exchange for increasing militarization of our U.S.-Mexico border, and criminalization and punishment of other immigrants. In other words, a trade between relief for some, and a more painful, harsher existence for others. It is that same tradeoff that immigrant youth, when asked to sacrifice the safety of their parents in order to obtain status for themselves, have consistently rejected. It is a false choice that we should reject as well. Second, CIR models have been flawed because they failed to recognize that in order for CIR to be truly comprehensive, we need to address the root causes and drivers of migration, including U.S. foreign and economic policies. Immigration must be seen through a global lens, rather than primarily through a domestic one, and as a naturally occurring phenomenon. Castro’s immigration proposal recognizes that. The third flaw, which is not intrinsic to CIR but instead to how we approach immigration policy, is that CIR has provided a convenient mechanism with which to further deny justice to immigrants, their families, and the communities in which they live. CIR became the receptacle for the basic necessities and rights that immigrant families should have, whether it’s access to affordable health care, nutrition assistance for immigrant children, or financial aid for college. While we make progress on those fronts, we tell immigrants that we’ll find a way to fit them in eventually. As a result, CIR has become the abyss in which we have stuffed the hopes and dreams of families, and that we use to further exclude and marginalize immigrant mothers, fathers, students, workers, and their loved ones from society. True justice for immigrants requires that Democrats include them when it comes to health care, housing, college affordability, family leave, and anti-poverty programs. And they can do that through numerous legislative vehicles both federally and at the state and local level. While the exact policy details remain to be seen, Castro has effectively reframed the debate away from the dead-end, enforcement-first model that Democrats have been futilely pursuing for over two decades. Instead of accepting that more border militarization, detention, and deportation are prerequisites for 11 million community members living and working here without work authorization to have a path to citizenship, Castro offers the country a people-centered approach putting people and families first. This bold leadership is a dramatic departure from what Democrats have pursued in the past, and it is in stark contrast with Trumpism. This is the right approach. If we’re serious about securing justice for families and about creating an immigration system that works for the country, it cannot happen under a model in which immigration policies are framed around criminalization, punishment, and exclusion. If we’re serious about defeating Trump in 2020, Democrats have to define an alternative to his hateful, anti-immigrant vision of what America is. We need a paradigm shift in which immigrants and the immigration system are seen as integral to our country rather than a problem that needs to be fixed. 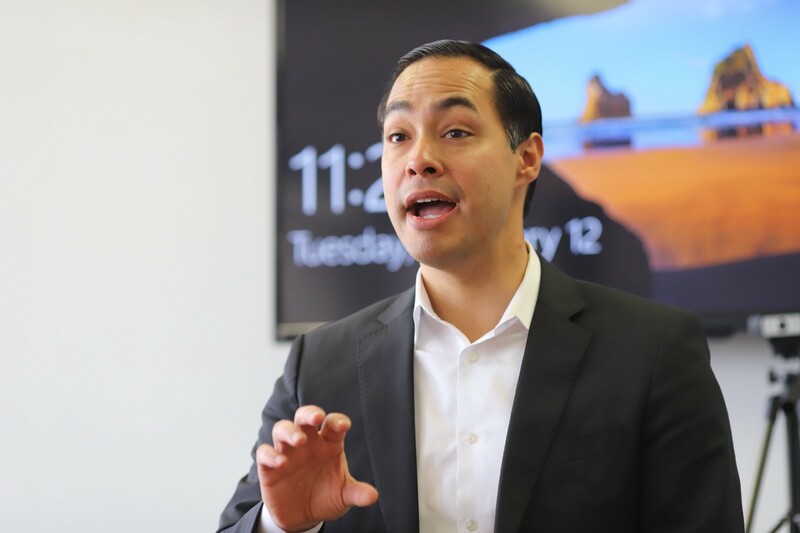 Castro is the first presidential candidate leaning into a new vision for how Democrats engage on immigration, but he is not alone in the Party. A not-so-subtle shift is taking place, with Democrats becoming increasingly bold in their embrace of pro-immigrant reforms. Recently, Congresswoman Pramila Jayapal (WA-07) and presidential hopeful Senator Bernie Sanders (VT) each introduced Medicare for All proposals that would provide health care access to all persons residing in the U.S. regardless of their immigration status. This isn’t just the right thing to do morally, but is just good health policy. Car accidents don’t happen only to citizens. And childhood asthma doesn’t only affect kids with green cards. We all face these and other health challenges, and making our nation healthier depends on ensuring that we can all get the care we need. This approach to immigrant inclusivity can and should be applied across the board, for every single progressive policy Democrats and 2020ers propose. Immigration is one of the defining issues of our times. As such, rather than dusting off the old CIR framework, what we need is a bold, new vision for our immigration system, one that rivals the boldness of the Green New Deal and Medicare For All. Castro’s proposal isn’t perfect, but it’s courageous in an arena that too often gets little more than partisan talking points. This isn’t just the morally right thing to do for millions of Americans who live, work, go to school, and pay taxes in America. It’s the politically necessary thing to do as Democrats head into a 2020 election that Trump is determined to define with immigrant attacks. Trump has skillfully used xenophobia and race as wedge issues. This is a fight for the soul of our nation and an opportunity for 2020 candidates to present a different, unifying vision for our country. Marielena Hincapié is the Executive Director of the NILC Immigrant Justice Fund. Ezra Levin is Co-Executive Director of the Indivisible Project.